If it's a sleek and modern outdoor living space that you're looking to create, TimberTech's collection of light grey decking boards is just what you need! These composite deck boards are sure to brighten up any space with their minimalist design, perfect for any contemporary design that you may have in mind. A perfect option if you're looking for an alternative to plastic or natural timber decking, our light grey decking compliment many modern buildings, creating the eye-catching space you want - Ideal for all tastes! With the additional benefit of practically zero upkeep requirements, our collection of light grey decking gives you the ability to sit back and enjoy your dream outdoor space without having to worry about spending time trying to keep it look good. To see just what our composite deck board ranges are capable of, take a look at our showcase video here! As a result of its ground-breaking manufacture, you will never have to worry about our light grey decking staining, fading or rotting. With zero maintenance requirements, our decking is an excellent substitute to plastic and wood decking. With a unique manufacture, through materials such as natural hardwood and polymer resin, our light grey decking is able to withstand an array of conditions. With a high-resistance to fades and stains, your deck stays looking as beautiful as the day it was installed. 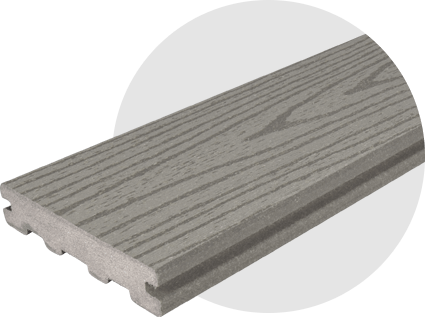 Through the production of the highest-quality materials, our light grey decking boards are built to last. Each comes with a standard 30-year warranty, meaning you won't have to worry about your deck rotting, split or decay for three decades! 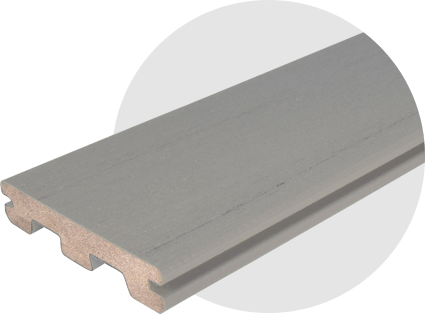 Our light grey composite deck boards come in various designs, suitable for a number of different tastes. Texture surfaces vary between linear wood grain, flat wood grain and grained capped with a full polymer sleeve. 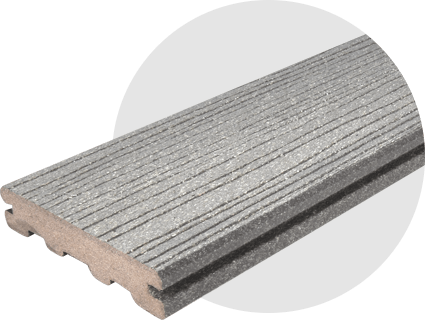 The boards also differ with two options to choose from: a non-capped wood polymer composite, or a fully capped composite. 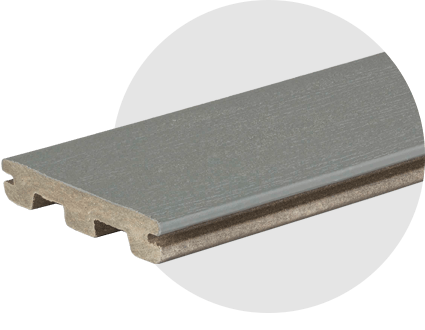 Our light grey decking boards come in two different styles, depending on how you would like your deck fastened: grooved and ungrooved.